Both Hurricane Harvey and Hurricane Irma brought a lot of destruction to the areas they recently moved through, creating an awareness amongst Minnesota homeowners about just how well their home could stand up to a tornado, if it were to hit their neighborhood. We have heard and seen on TV tornadoes ripping apart houses and even small towns in the state. The power of these storms should never be underestimated, while hurricanes are more devastating because of the wider paths of destruction, tornadoes pack the highest wind speeds on earth and have the ability to completely destroy a house, or even a small town. If you’re currently thinking about buying or building a new home, there are a few things you should know when it comes to making your home tornado proof, and then may be speak with a custom home builder in the area. Although it’s highly unlikely that a hurricane will hit Minnesota, the staff at KSTP-TV put an image “How It Would Look if Hurricane Irma Hit Minnesota”, with the eye of the storm directly over the Twin Cities. They visualized that Irma – whose eye was nearly 80 miles wide– would take up much of the metro area. In fact, from northwest to southeast, the huge storm would run from Elk River all the way down to near Hastings! It is more likely that Minnesota residents will experience a tornado, which can also cause a lot of destruction due to high winds and extreme rainfall. Houses are damaged often in Minnesota by passing tornado’s, making it a good idea for residents to look into tornado resistant homes. While a hurricane causes more damage, tornadoes happen more often. When a hurricane or tornado hits, you never know what’s going to happen. It could move through an area causing minimal damage, or it could destroy an entire city. The aftermath could leave one house completely untouched, while completely demolishing another one right next to it. The fact that a few mobile homes and many high-rise buildings were still standing in areas that were hit hard during the recent hurricanes has many wondering why. Because stricter construction and installation regulations were enforced many years ago, which for the most part required a stronger framework and a better way to anchor the structure. FEMA recommends building a safe room – an entirely new structure within the house preferably in the basement or garage, which could double as a storage or closet. Another option they say is to modify a bathroom or a closet to International Code Council (ICC)-500 standard. There are a few factors that go into creating a tornado proof house. The materials used must be of superior strength, the design of the house must include a way to resist damaging high winds, the shape of the house must be nature friendly, and there needs to be a way to strongly connect the entire house together so it stays together during extreme weather conditions. One of the materials used to tornado proof a house is concrete. Concrete walls are able to withstand extreme weather conditions, and when specifically tested for structural damage using conditions similar to a hurricane, they showed absolutely no structural damage. RCH can help you design a safe room within your house for protection against extreme weather conditions. 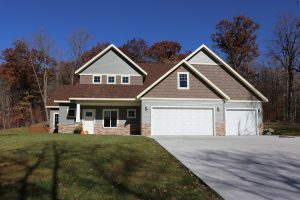 RCH Custom Homes is a leading custom home builder in Minnesota that welcomes input from their customers when remodeling or building a new home. When it comes to building a tornado resistant home, our professional team of home contractors understand what it takes to build these types of homes because we’re always on top of the latest building codes. If you’re looking for local homebuilding professionals, look no further. RCH Custom Homes is a family owned and operated business that’s been building custom homes for over 15 years. Call 218-790-1468 with your questions!